Some people like to have a clear division between their private life and their professional life. I can easily imagine jobs for which I would have no interest in socializing with my co-workers. Life as an expat is a bit different. Often the line between private and professional is blurred. And colleagues can easily become friends. Partly out of necessity but in most cases because we share the same interests, and curiosity is an important reason that brought us to choose the expat life. All this to say that I ended up at a friend’s (and colleague’s) 50th birthday party today. The nice thing about adults’ birthday parties is that adults usually enjoy my gifts. Kids are less thrilled with books! On my way back from Hedengrens (by far my favourite bookstore in Stockholm) where I got the present for my friend’s birthday, I decided to stop at Kulturhuset Stories for coffee. There are a few Stories in Stockholm but I have only been to the one at Kulturhuset. Actually, I have been here many times but today was the first time I went to Stories by myself and just for fun. 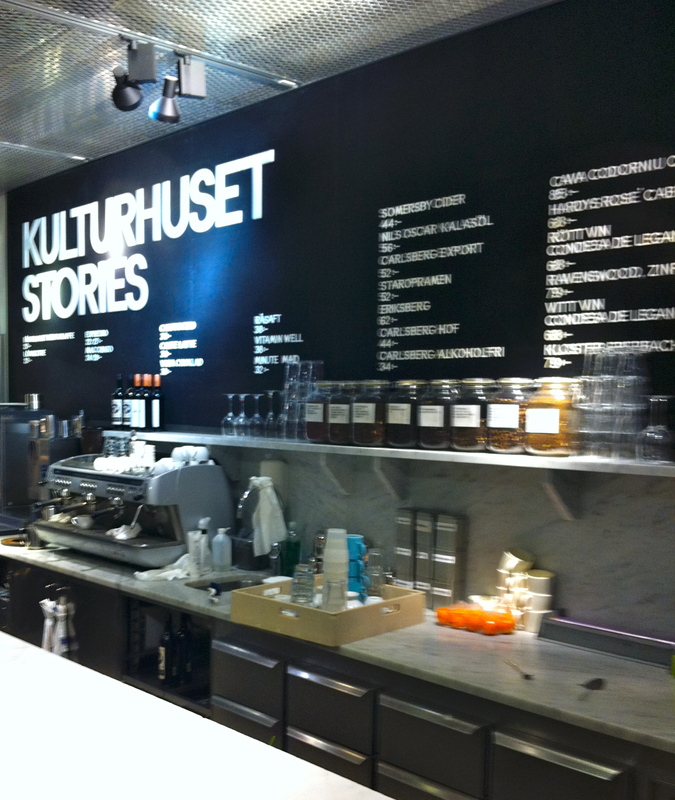 Since my office is right next to Kulturhuset, Stories is the perfect place to meet colleagues over coffee. The place is great for “informal” meetings and the location could not be better for me. So good in fact that I don’t even bother putting my jacket on when I go there, even when it’s minus 10 out! Kulturhuset is an amazing place! Administratively, it’s part of Stockholm City. It’s located at Sergels torg, right at T-Centralen. All subway lines in Stockholm go through T-Centralen. Going to Kulturhuset could not be easier. There is a little bit of everything at Kulturhuset: theatre, movies, dance, literature, music, but also debates and conferences. In additional to Stories, there are a few other cafes and restaurants. And of course, the place is very children-friendly, with a “room for kids”. 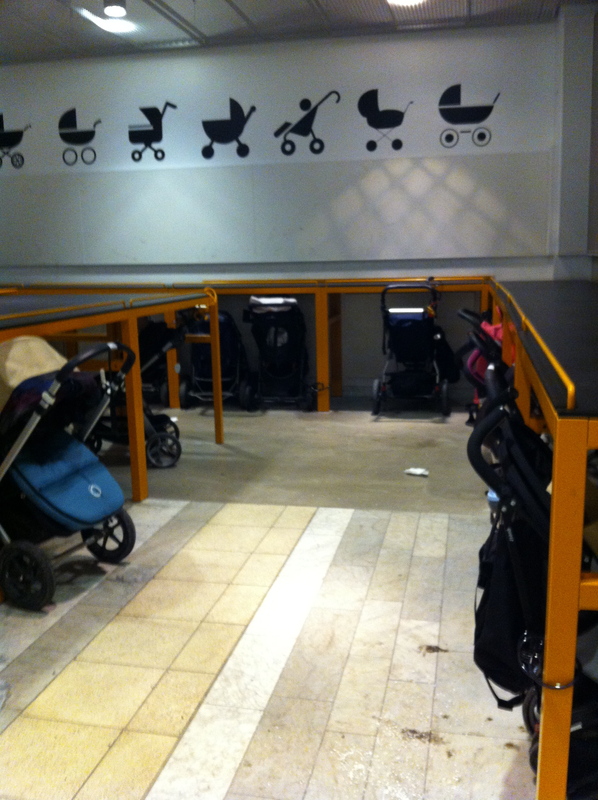 And since this is Stockholm, children-friendly also means a parking for strollers! Kulturhuset is a huge place, and so is everything there, including Stories. Again, this is not the kind of cafés I usually prefer but Stories has something different which makes me want to go back all the time. It is not ideal when you are on your own and want to read quietly. The place is meant for people to meet. There are a lot of movements, there is a lot of noise and everything seems to go fast. And yet, there is something at Stories which is very relaxing. It might have to do with the nice cakes. 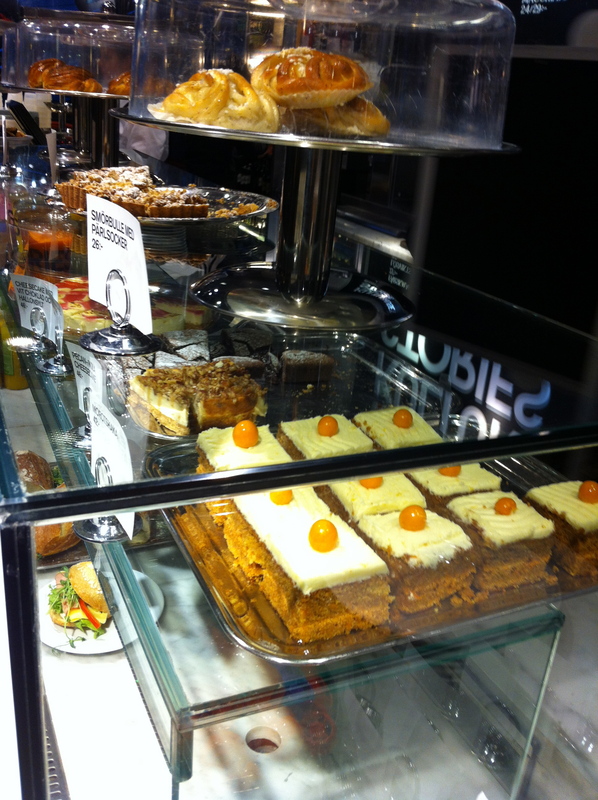 I realized today that I may have developed an addiction to carrot cake in Sweden. As I was about to order the cheesecake, I changed my mind literally as I was ordering and got the carrot cake. This is not the first time this is happening to me! I did not regret it. 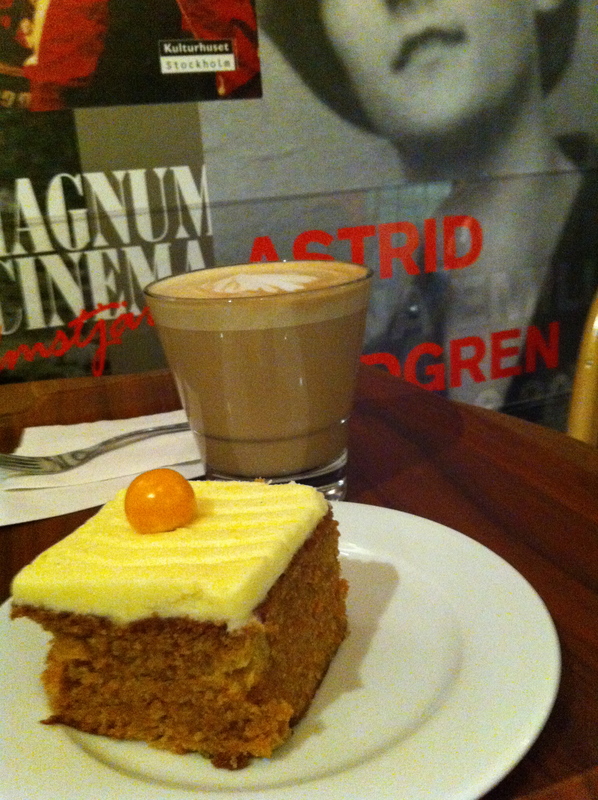 While Stories is a busy place on a Saturday afternoon, I managed to find a quiet place in a corner, next to some nice posters where I was able to enjoy my latte and cake while writing the birthday card and a few words in the two books I got for my friend. For those who might be wondering, my friend got Alice Munro’s Dear Life and Michael Oondatje’s The Cat’s Table. And since I cannot go to Hedengrens without getting books for myself, I also got Sara Stridsberg’s Darling River, Dany Laferrière’s La Chair du maître and August Strindberg’s Röda Rummet (yes, in Swedish but the comic book version!). Hey, it’s always a delight to find one of your posts in my inbox! Looking forward to hearing more.